together with oxidative phosphorylation, the main source of energy in the mammalian body and the end toward which carbohydrate, fat, and protein metabolism is directed; a series of reactions, beginning and ending with oxaloacetic acid, during the course of which a two-carbon fragment is completely oxidized to carbon dioxide and water with the production of 12 high-energy phosphate bonds. So called because the first four substances involved (citric acid, cis-aconitic acid, isocitric acid, and oxalosuccinic acid) are all tricarboxylic acids; from oxalosuccinate, the others are, in order, α-ketoglutarate, succinate, fumarate, l-malate, and oxaloacetate, which condenses with acetyl-CoA (from fatty acid degradation) to form citrate (citric acid) again. A series of enzymatic reactions in aerobic organisms involving oxidative metabolism of acetyl units and producing high-energy phosphate compounds such as ATP, which serve as the main source of cellular energy. Also called citric acid cycle, tricarboxylic acid cycle. Fig. 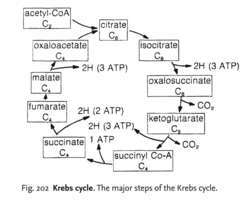 202 Krebs cycle . The major steps of the Krebs cycle. a circular series of reactions that forms part of CELL RESPIRATION in the presence of oxygen, occurring in many microorganisms as well as higher organisms. In eukaryotes the cycle occurs in the matrix of MITOCHONDRIA. The steps of the cycle were deduced by Sir Hans Krebs (1900–81), for which he received a Nobel Prize. 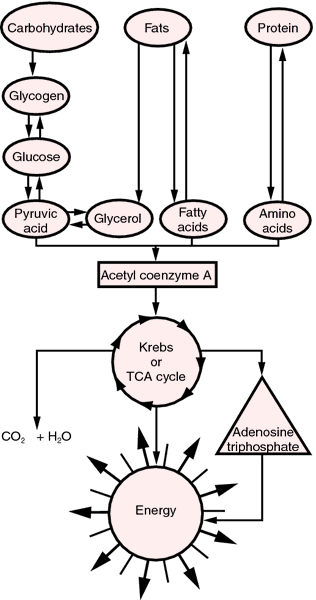 The reactions leading up to the cycle by which ACETYLCOENZYME A is produced, together with the overall role of the cycle in the breakdown of complex molecules is described fully under AEROBIC RESPIRATION. Each turn of the cycle releases 2 molecules of carbon dioxide, 8 hydrogen atoms that produce 11 molecules of ATP via the ELECTRON TRANSPORT SYSTEM, and 1 molecule of ATP produced by SUBSTRATE-LEVEL PHOSPHORYLATION. Two turns of the cycle are needed to complete the breakdown of one glucose molecule. Sir Hans Adolph, German biochemist in England and Nobel laureate, 1900-1981. Krebs-Ringer solution - a modification of Ringer solution. a sequence of reactions within mitochondria, constituting the final common pathway for the oxidation of all fuel molecules (glucose, fatty acids and amino acids), in which carbon atoms enter the cycle as acetyl-CoA and emerge as carbon dioxide, and the electrons produced are transferred to the electron transport chain. Also provides intermediates for biosynthetic processes. Syn citrate cycle, citric acid cycle, tricarboxylic cycle. A series of reactions in which the intermediate products of carbohydrate, fat and protein metabolism are converted to carbon dioxide and hydrogen atoms (electrons and hydrogen ions). This cycle can only operate in the presence of oxygen. Further oxidation yields carbon dioxide, water and ATP. This cycle occurs in the mitochondria that are found in the cytoplasm of cells of living organisms. It forms one of the processes in the metabolism of glucose providing energy (stored in ATP) to maintain the vital functions of the cells (e.g. mitosis). This cycle represents the principal energy pathway of the corneal endothelium. Syn. citric acid cycle; tricarboxylic acid cycle. See mitosis. The degradation of fatty acids by the glyoxylate cycle for the production of energy involves [beta]-oxidation, with its particular characteristics in glyoxysomes, glyoxylate cycle, Krebs cycle, gluconeogenesis and glycolysis. While the bypass of decarboxylation reactions of Krebs cycle confers evolutionary adaptations to the organisms when present, it also determines a lesser energy amount generated per carbon atom when compared to the fatty acids' degradation in animals. Electron transport, also sometimes called oxidative phosphorylation (as distinguished from photophosphorylation), is the process by which electrons are passed from the oxidation of Krebs cycle organic acid to the electron acceptor NAD and subsequently to flavin mononucleotide (FMN), coenzyme Q, cytochrome b, cytochrome c, cytochrome a, and cytochrome [a. Such opportunities occur at three sites of the Krebs cycle, enter into the electron transport chain at a later position, and make only two molecules of ATP. Subsequently, the Krebs cycle releases electrons and protons to NAD at three locations in the cycle, each forming 3 ATP, for a total of 9 ATP. In the present study, the expression of creatine kinase M-type was up-regulated in the livers of ketotic cows, which suggested that excess ATP, produced by Krebs cycle as mentioned above, may also come from the protein synthesis pathway because inhibited protein synthesis would decrease the demand for ATP which was stored in the form of phosphocreatine. As shown in Figure 2, the substrate for gluconeogenesis was mostly supplied by glucogenic amino acids through the Krebs cycle (including via oxalacetic acid or via fumarate or viaa-ketoglutarate or via succinyl-CoA) or pyruvate (Danfaer et al. This article is a description of a role-play where students act out some major parts of cell metabolism to gain greater conceptual understanding of glycolysis and the Krebs cycle by "being" a molecule or a key part in a dynamic cellular process. 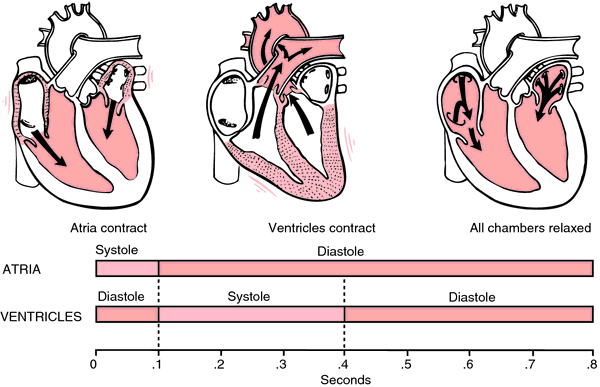 Consequently, teaching assistants emphasize that the role-play described in this study is purposely limited to only some particular aspects of the molecular or submicroscopic cellular processes of glycolysis and the Krebs cycle (the fate of the carbon atoms). Deranged oxygen signaling and impaired Krebs cycle chemistry are at the roots of all chronic disorders. Simple tests done to measure the urinary excretion of the metabolites of Krebs cycle and glycolytic pathways, mycotoxins, and hippuric acid in the subjects of his study would have shed much light on what was observable and documentable in the chemistry of those afflicted by the putative occupational mass psychogenic illness. one turn of the Krebs cycle produces -- molecules of carbon dioxide plus -- molecules of NADH and -- molecule of FADH2.